We’re not saying Gabriella and Kevin are Batgirl and Batman, we’re just saying we’ve never seen all four of them in a room together. 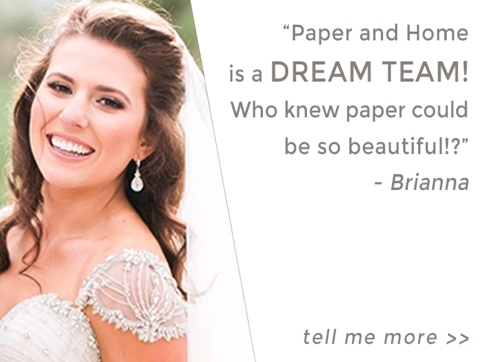 We were so excited when Bree and Kevin contacted us in their quest to create Batman wedding invitations and stationery for their super hero wedding. We connected right away on the idea of subtlety incorporating Batman elements, while maintaining overall elegance and glam. 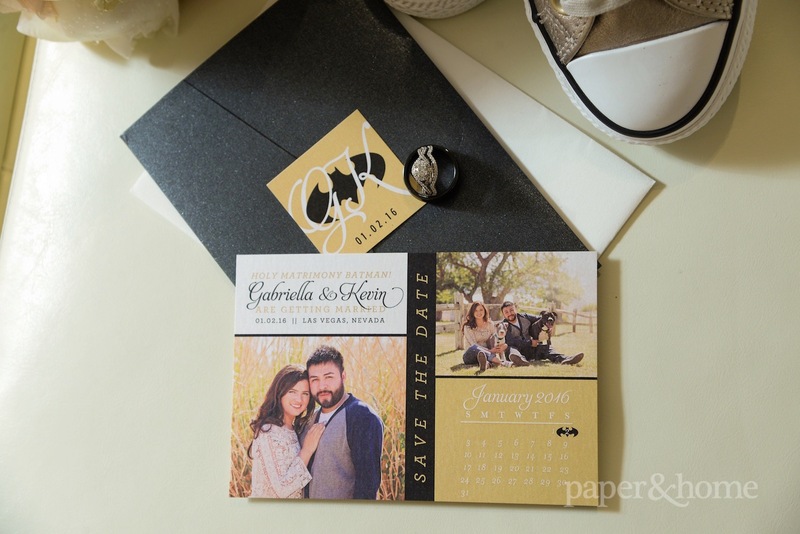 We started with their photo save the dates, showcasing a January calendar and the couple’s engagement photos. 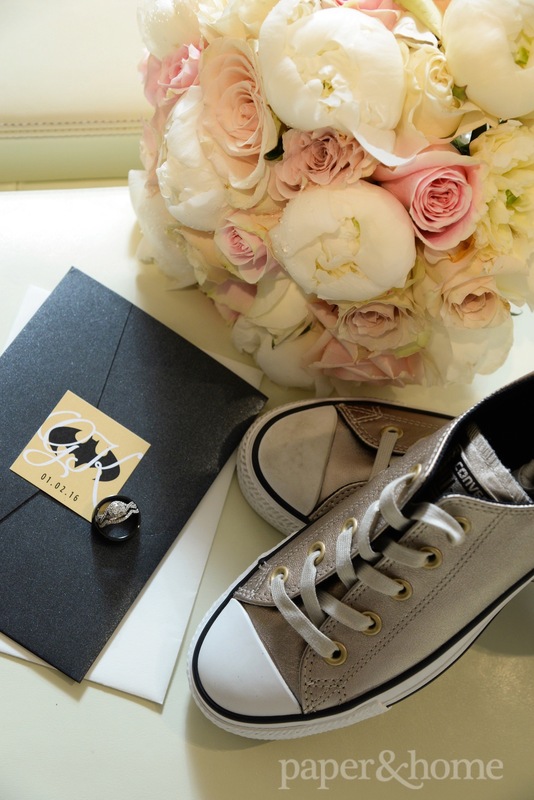 We used Batman’s favorite colors – yellow and black – and introduced his symbol discretely over the wedding date to mark the spot. 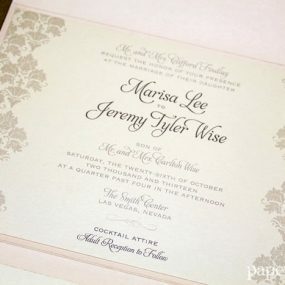 The save the dates were printed on our pearl shimmer stock to add a glamorous shine. The fun doesn’t stop there. 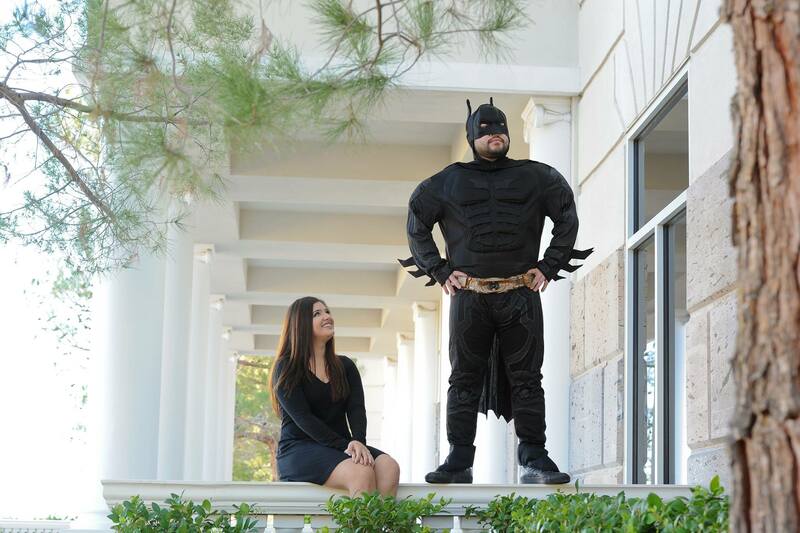 A bat signal in the sky indicated that this super-couple is ready to get started on their invites! 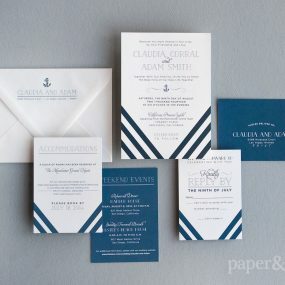 Applying elements from our Ready-to-Order design, the Heather Collection, we worked in collaboration with the couple to dream up the perfect invitation set for the occasion. Festive yellow dots trickle down to the event details, and are carried over onto the coordinating reply postcard. 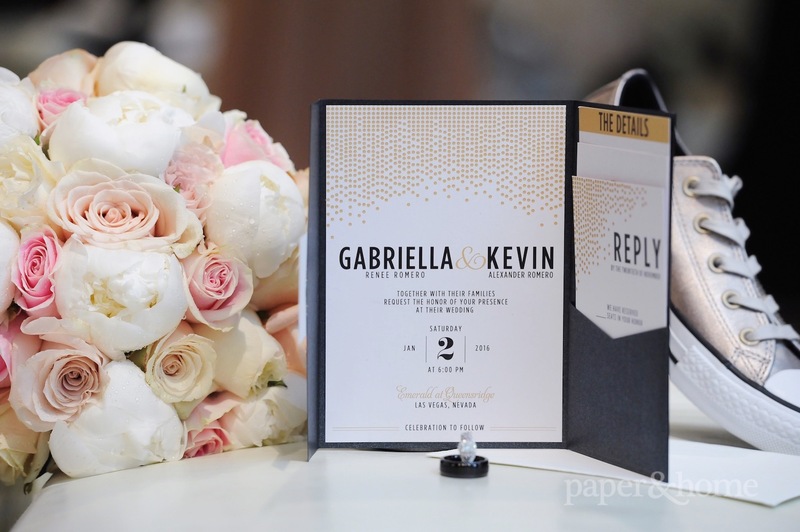 The Batman symbol is reintroduced on the tag mounted onto the shimmery black pocket folder that holds the invitation. The symbol also acted as a foundation for their custom monogram. 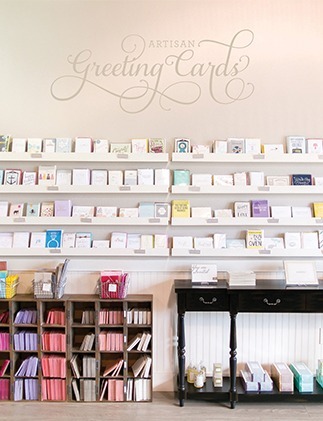 A gold glitter envelope liner encapsulates this super-stationery set, and gave guests that dramatic POW! when opening up the invitation. 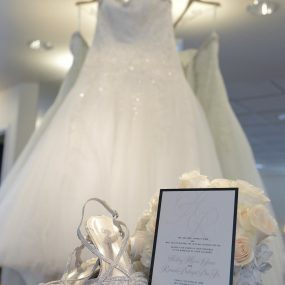 The reception took place at the lavish and romantic Emerald at Queensridge. 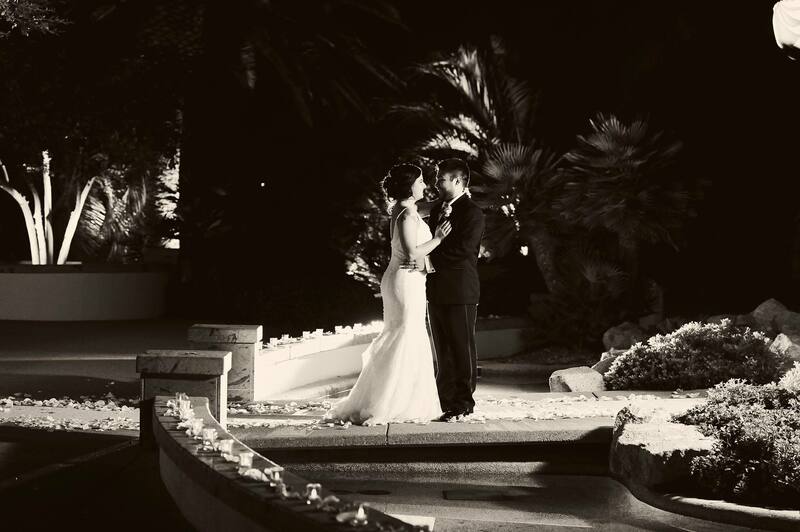 We love Emerald’s outdoor setup with waterscape accents and a majestic view of Red Rock Canyon—the only better wedding venue for this celebration is Gotham City itself! We’d love to hear what you think of these Batman wedding invitations in the comments below.